BOA 18: 7 Days Best of Kenya Budget Safari. After breakfast we depart and drive to Masai Mara with stopover at the Great Rift Valley. Arrive in good time for hot lunch at Destiny Eco Camp Mara; An afternoon game viewing will follow from 3:30 pm to sunset then return to the camp late in the evening just in time for dinner. A campfire gathering under the clear Africa’s Sky follows after dinner and overnight.Accommodation Destiny eco camp mara. 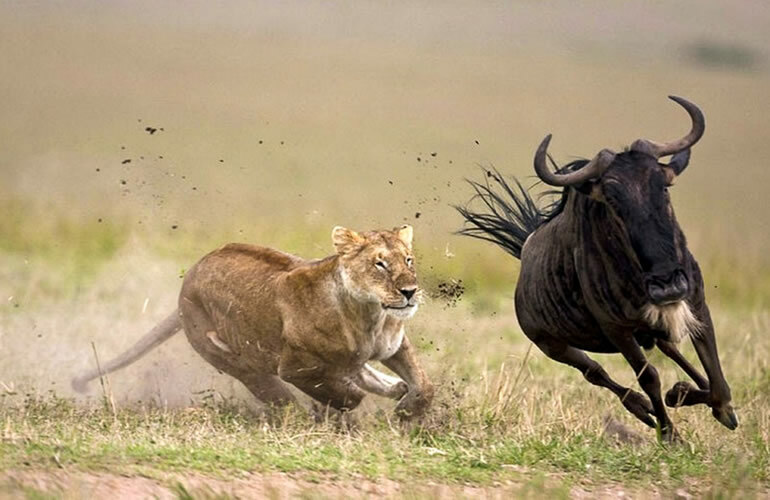 Masai mara is well known for wildebeest migration which is a flurry of activity. "Migrants' tag along the big cat team (lion-the jungle king, leopard - Mr. Military camouflage, cheetah - race track ruler that get attracted to this “rhythm of a feast” as they prey on the migrants. The silver-backed jackal, African wild dog, the sly fox, and of course the maniacal spotted hyena “true garbage-man of the savannah” can be spotted lurking in the shadows, waiting for their meaty fill, as the soaring vulture eagerly waits for the remains only to clean up after the party. This maasai mara famous. A full day is spent at the Masai Mara game reserve. 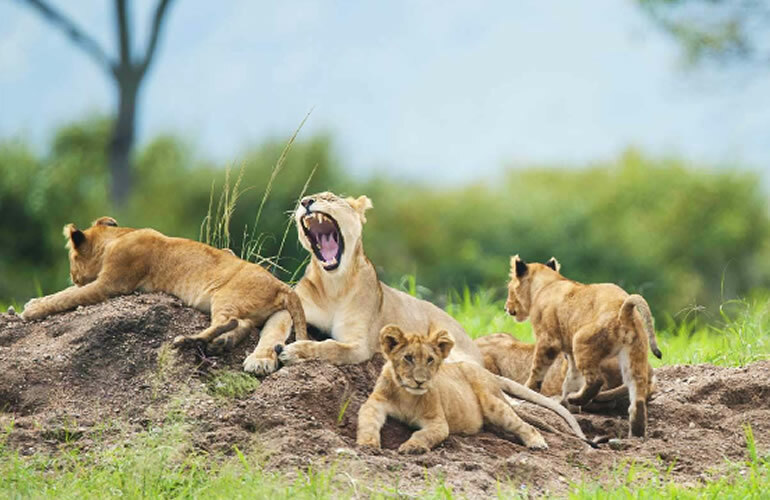 We drive across the plains in search of the big cats (black manned lions, Cheetahs and leopards with picnic lunch served at the Mara River picnic site. Vast herds of wildebeest and zebra wander across the Mara grasslands in huge numbers within the savanna grassland more so in the month of June through august to the end of October, when millions of wildebeest, zebra, and gazelle traverse the Mara plains landscape to feed on the rich new grass from the Serengeti National park. You also have a chance to see other plain game like the Topi, hartebeest and Eland. Dinner and overnight at the Destiny Eco Camp Mara. Early morning sun rise game viewing within the savanna grassland in such of early morning game till late around mid day when the sun is overhead and most of wildlife goes into hiding, we shall then return to the camp for hot lunch followed by a guided nature walk or maasai village as no visit to Kenya is complete without this truly unique cultural experience. See the day-to-day lifestyle of the Maasai first hand by visiting a functioning Boma, an authentic residence of local Maasai who welcome clients into their homes, a small contribution of 10 us dollars per person to them is very much appreciated to enable them buy some few items for their schooling kids. That is payable direct. Finally time yourself for an evening game viewing from 16:00 hrs to sunset for a good shot on the wild games and also taking photos of giraffe as it follows the sun sinking into its horizon. Return to the camp more exited than ever before after accumulating all the extra ordinary happenings of the day. Soon after breakfast we shall set off and drive lake Nakuru national park arriving in good time for lunch. In this park you will proceed for an extensive game viewing in search of cats in this park. Acacia trees which are leopards favorite and also we will be in search of Rhino. 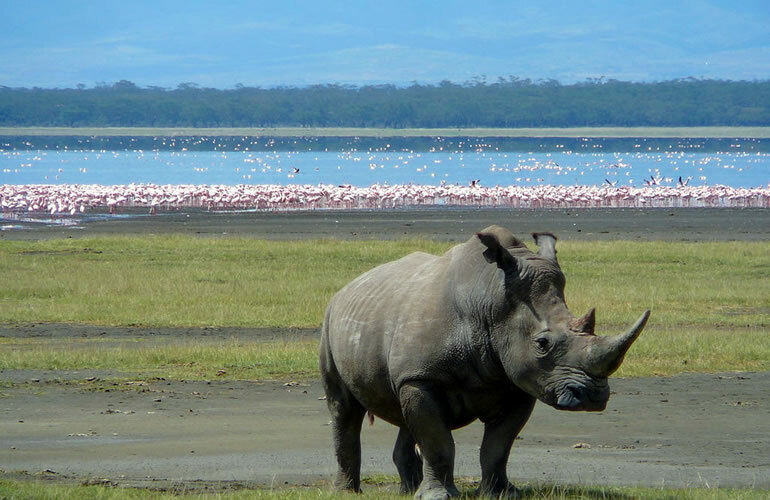 Nakuru is the home to the White rhinos and has tens of Black rhinos too. Lake Nakuru National park is known for its millions of flamingos and other water birds like the Pelicans and Cormorants. No wonder Americas finest photographer - Roger Tory Petersen described it as the best photographic Paradise in the World for its seasonally large concentrations of greater and lesser flamingos, Lake Nakuru boasts some 600-bird species. It is also a designated rhino sanctuary, as well as home to other rare wildlife species. Diner and overnight at the Flamingo Hill Camp. Early morning we shall set off with a game drive. The journey continue to amboseli national park which is one of the most popular wildlife sanctuaries in Kenya. It is situated close to Kenya- Tanzania border, the park lies at the foot of Mt. Kilimanjaro, the highest mountain in Africa (5,896m) whose snow-capped summit presents a splendid view on clear days. Amboseli National Park is often referred to as “The home of Elephants’ some of the largest Elephant herds are found here. The Game Park also contains vast groups of Zebras, Wildebeests, Giraffes, Buffalo, Hippos and Antelopes. 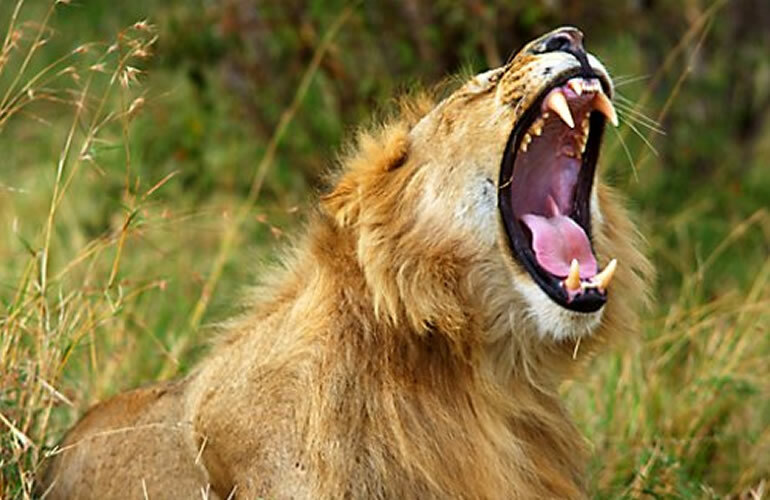 Also to be found in Amboseli are lions, leopards, Cheetahs, Rhinos and many species of plain gamed through thousands of meters of volcanic rock from Mount Kilimanjaro. Animal species seen include elephant, zebra, wildebeest, giraffe, impala and leopard. The bird life seen here includes pelican, bee eater, kingfisher, African fish eagle and pygmy falcon. The rest of the evening will be at kibo safari camp. Morning and afternoon game drives over the park's dusty roads (Giving the true meaning in Maasai language Amboseli meaning dusty whirl winds), you're likely to spot wildebeest, giraffes, Gazelles, Impala and zebra attracted to the marshes and swamps fed by the melting snows of Kilimanjaro. You may also spot lions on the fringes of the marshes as well as a great variety of bird-life (some 425 species of bird populate the park). With Kilimanjaro providing a dramatic backdrop, your photographs will be stunning with Elephants, which makes Amboseli popular as there in hundreds. Dinner and overnight at Kibo safari camp. Meal plan; breakfast Lunch and Dinner. This will mark the of the end of seven days safari with us and before we set off for Nairobi we shall have early morning game viewing. Safari will then end in Nairobi.